For over 20 years, Marilyn has employed the knowledge of shamanism and the magic of ceremony to guide people through the step by step process of healing their past, balancing their emotions, and learning to command their minds. Whether through journeying for a totem animal, making an ally of death and change, or healing, reframing and reclaiming your personal history, shamanism is hands on, experiential, and life changing. The ancient rituals and techniques of shamanism are fully translatable and much needed in contemporary life. Marilyn is co-founder of the Institute of Shamanic Medicine and co-author of Shamanic Ceremonies for a Changing World. 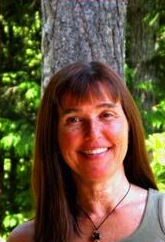 She is a shamanic coach and a shamanic practitioner and teaches across Canada and at home in British Columbia. She takes a particular interest in the Arts of Dreaming and Stalking and in the techniques of Recapitulation, used in the Silent Power program. If you are ready to touch Spirit more directly and are called to do some personal healing and transformational work with Marilyn, click here for more information. Or look under One-on-One Work at some of the individual offerings that might interest you.